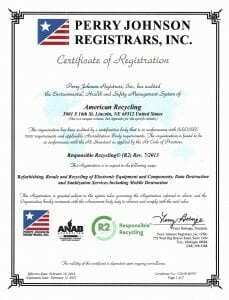 American Recycling is R2:2013, ISO 14001:2015 and OHSAS 18001:2007 Certified! Founded and managed through Sustainable Electronics Recycling International (SERI), R2 (Responsible Recycling) :2013 Standard is the leading global certification standard for the electronics reuse and recycling industry. The requirements in the R2 Standard are designed to protect people, protect the environment, protect data, and preserve resources. This is achieved through rigorous annual 3rd-party audits of R2 certified facilities and through transparency and accountability throughout the entire reuse/recycling chain of used electronic products. What is ISO 14001:2015 Certification? What is OHSAS 18001:2007 Certification? Why this is Important and how it impacts our company? As stated in our Environmental, Health and Safety policy; American Recycling is committed to following the R2: 2013, OHSAS 18001:2007 and ISO 14001: 2015 requirements and to maintain conformance to the requirements of our EH&S management system and scope. We are equally committed to meet or exceed our customer requirements, to continually improve our processes and to maintain compliance with relevant environmental, Occupational Health and Safety and data security legislation and regulations. The goal of American Recycling’s operation is to have a positive impact on the environment through responsible recycling requirements that includes the conservation of metals, plastic and other non-renewable resources. Consistent with these core operations, it is American Recycling’s overall goal to accomplish its business objectives while meeting and exceeding the environmental and health & safety expectations of our management, employees, customers, suppliers and regulators. We will continually improve our systems while striving to minimize adverse impacts on the environment by managing and tracking through the recycling chain used and end-of-life electronic equipment, components and materials, including focus materials as identified in the R2: 2013 Standard –with respect to both on-site activities and the selection of downstream vendors – using a “reuse, recover, dispose” hierarchy of responsible management strategies. BBB Accredited – For 3 years in a row, American Recycling has had an A+ rating from the Better Business Bureau. more about what we do?